Abstract: Introduction: Coexistence of more than one autoimmune disease (AD) in a single patient is known as polyautoimmunity, and may be seen in up to 35% of patients with ADs. The elimination of B-cells using Rituximab (RTX) improves clinical status in different ADs. The role of cytokine production by B-cells is unclear in systemic lupus erythematosus (SLE) and polyautoimmunity. Methods: As an exploratory study, plasma from 11 patients with either rheumatoid arthritis (RA) or SLE-associated polyautoimmunity was assessed prior and 6 months after therapy with RTX. Eight healthy individuals were used as controls. Cytokine levels were measured using ELISA (IFN-α and TGF-β1) or Cytometric Bead Array (TNF-α, IL-1β, IL-6, IL-8, IL-10, and IL-12p70). 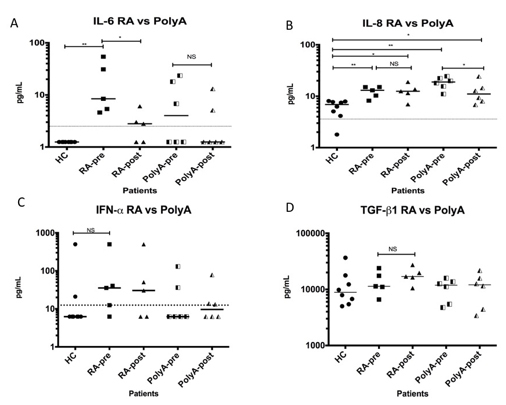 Results: Prior to RTX, IL-6 was only elevated in RA and IL-8 was elevated in both RA and SLE-associated polyautoimmunity, compared with controls. After RTX, significant decreases of IL-6 in RA and IL-8 in SLE-associated polyautoimmunity were observed. Levels of other cytokines measured were either similar (IFN-α, TGF-β1) or below the detection limit (TNF-α, IL-1β, IL-10, IL-12p70) for both patients and controls. Conclusion: Our data highlight the importance of B-cell cytokine secretion in RA and SLE-associated polyautoimmunity, and suggest a differential role in each pathology. A significant increase of IL-8 prior to RTX in both groups, and a significant decrease after therapy only in SLE-associated polyautoimmunity support the potential of IL-8 as a therapeutic target. The heterogeneity of the polyautoimmunity patient population highlights the importance of the selection of specific subsets in future research. Keywords cytokines, interleukin-8, rheumatoid arthritis, systemic lupus erythematosus, rituximab. Resumen: Introducción: La coexistencia de más de una enfermedad autoinmune (EAI) en un paciente se conoce como poliautoinmunidad (PAI) y se observa en el 35% de los pacientes con EAI. La eliminación de linfocitos B usando rituximab (RTX) controla la actividad de diferentes EAI. En el lupus eritematoso sistémico (LES) y en PAI no es clara la producción de citocinas por los linfocitos B. Métodos: Estudio exploratorio. Se obtuvo plasma de 11 pacientes con artritis reumatoide (AR) y poliautoinmunidad asociada a LES (PAILES) antes y después de rituximab (i. e., 6 meses). Como controles se utilizaron ocho individuos sanos. Las citocinas se midieron por ELISA (IFN-α, TGF-β1) o Cytometric Bead Array (TNF-α, IL-1β, IL-6, IL-8, IL-10, IL-12p70). Resultados: Previo a RTX, IL-6 se encontró elevada únicamente en AR, mientras que IL-8 lo estuvo en AR y en PAILES, comparados con controles. Después de RTX se encontró una disminución significativa de IL-6 en AR y de IL-8 en PAILES. Las concentraciones de otras citocinas medidas fueron similares (IFN-α, TGF-β1) o se encontraron por debajo de límite de detección (TNF-α, IL-1β, IL-10, IL-12p70), tanto en pacientes como en controles. Conclusión: Los datos resaltan la importancia de la secreción de citocinas por los linfocitos B y sugieren un rol diferencial en cada patología. El incremento de IL-8 previo a RTX en ambos grupos y la reducción después de la terapia en PAILES respaldan el potencial de la IL-8 como objetivo terapéutico. La heterogeneidad de la población de pacientes con PAI reafirma la importancia de la selección de subgrupos específicos en estudios futuros. Palabras clave: citocinas, interleucina-8, artritis reumatoide, lupus eritematoso sistémico, rituximab. Autoimmune diseases (ADs) present an overall cumulative prevalence of 5% worldwide (1). Coexistence of more than one AD in the same patient is known as Polyautoimmunity (PolyA) (2), and was observed in up to 35% patients with ADs in a cohort study involving systemic lupus erythematosus (SLE), rheumatoid arthritis (RA), systemic sclerosis (SSc), and multiple sclerosis (MS) as index diseases (2). B-cells are essential for the development and disease activity of ADs, and their elimination using B-cell depletion therapy (BCDT) improves clinical status (3). B-cells can (a) act as antigen-presenting cells, thus activating T-cell responses; (b) act as effector cells producing antibodies (Ab), or (c) have an immunomodulatory role through cytokine production, which could activate or modulate T-cells or other immune cells (4,5). BAFF (B-cell activating factor, also known as B lymphocyte stimulator, BLyS) and APRIL (a-proliferation inducing ligand) are some of the most important cytokines influencing development and survival of B-cells, and, in turn, play a major role in ADs pathophysiology (6). Nonetheless, several other cytokines are secreted or influence the growth and function of B-cells. For instance, B-cells are capable of producing different cytokines, including IL-6 (7), IL-8 (8), TNF-a (9),(10), IL-12 (11), IL-10 (12), and TGF-b (12). Further, as cytokines interact in a complex communication network, with negative and positive feedback loops, some cytokines considered to be more associated with innate or T-cell immune responses influence B-cell responses. For instance, TNF-a, IL-1, IL-6, and IL-12 impact B-cell proliferation, immunoglobulin secretion and isotype switching (13,14,15). Noteworthy, gut microbiota-driven production of IL-1b and IL-6 appears to induce regulatory B-cells (16). Moreover, Type I interferons (IFNs; e.g., a or b) impact B-cell function through a plethora of mechanisms, including Toll-like receptor expression and activation of other immune cells, such as dendritic cells (DCs) (17). Type I IFNs increase B-cell survival factors production, such as BAFF (17). A feedback loop between BAFF and Type I IFNs has been proposed (18). Therefore, altering Type I IFN pathways can abrogate autoimmune phenomena. The crosstalk between B cells and plasmacytoid DCs in ADs, and the role of B cells in the enhancement of type I IFN production by plasmacytoid DCs are also well known (19). The clinical response (or its absence) to rituximab (RTX) may be explained, at least partly, by the depletion of specific B-cell sub-populations that alter these interconnected processes. Noteworthy, as mentioned, measured plasma cytokines may be produced by several cell populations, which must be considered during the translation of bench results to the bedside. Cytokine production by B-cells appears to be important in several ADs. This ability seems to be central in RA pathogenesis, as clinical studies suggest an Ab-independent mechanism for BCDT efficacy. For example, atacicept—a recombinant chimeric fusion protein that comprises the BAFF and APRIL TACI receptor (transmembrane activator and calcium modulator and cyclophilin ligand interactor) that impairs maturation, function, and survival of B-cells, including Ab-producing plasmatic cells (6)—reduced rheumatoid factor and Anti-Citrullinated Protein Antibody (ACPA) levels without clinical improvement (20,21). In addition, treatment with RTX, a monoclonal Ab which targets CD20 and depletes most of B-cells virtually sparing plasmatic cells, showed clinical efficacy, particularly in seropositive RA patients (22,23,24,25). RTX efficacy was not associated with Ab levels (26), and some patients in remission persisted with high Ab titers after treatment (27). Moreover, a subgroup of patients with elevated ACPA did not improve after RTX treatment, in contrast to some RA seronegative patients (22). Finally, clinical trials involving several new medications focused on cytokine targets have shown promising results for RA patients (28). SLE and Sjögren’s syndrome (SS) are often associated with PolyA (29,30,31). Although auto-Ab production appears to be the hallmark of SLE, the pathogenic role of B-cells in the disease involves other mechanisms. Depletion of B-cells in a murine model of SLE abrogated disease development. However, when B-cell Ab production capability was eliminated, mice still developed SLE features, which suggests an Ab-independent role (32). Evidence in humans has shown that BCDT using belimumab, a monoclonal Ab targeted at soluble BAFF that impairs B-cell development and survival (6), is effective as SLE treatment (33,34). However, RTX showed an overall poor efficacy for SLE, although some patients showed improvement (35,36). These findings suggest that certain SLE subgroups might be identified prior to therapy (3). On the other hand, SS is considered to present with B-cell hyperactivity, mainly through Ab production, but cytokine derangement related to B-cell development has been also observed (37). Furthermore, RTX therapy has been effective in SS (38) and cytokine levels show a significant decrease after therapy (39). RA may also be associated with PolyA (2) and its coexistence with SLE is known as Rhupus, with a prevalence as high as 10% in SLE patients (40,41). RTX has been shown to improve the clinical presentation for both entities (42). Although the pathological role of B-cell derived cytokines appears to be evident, their clinical utility is unclear. However, as both B-cell and cytokine- targeted therapies have been shown to be effective in the management of RA and probably of SLE, B-cell derived cytokines ought to play a fundamental role in their clinical efficacy. For instance, B-cells producing IL-6 and TNF have been identified in the synovial tissue of RA patients (3). As these cytokines can stimulate bone resorption, cartilage destruction, and local activation of macrophages, their role appear to be pivotal in RA clinical manifestations (3). Interestingly, BCDT therapy has been shown to reduce macrophages in joint tissues (3). Accordingly, IL-6 polymorphisms have been associated with lower efficacy to RTX (43), whereas increased baseline serum IL-6 levels were more frequent in non-responders and a significant reduction was observed in responders (44). Noteworthy, the former group showed a better response to IL-6-directed therapy (i.e., tocilizumab) when compared to T cell costimulation blockade (i.e., abatacept) (44). In addition, some evidence has demonstrated the regulatory role of B-cell derived IL-10 in murine models and RA patients, in whom a reduction in its secretion was associated with an enhanced disease activity, and a shift towards an antiinflammatory milieu after BCDT was suggested (3). However, its regulatory role in SLE is conflicting. It has been hypothesized that IL-10 production by autoreactive B-cells might promote clonal expansion in an autocrine manner (3). Whether B-cell cytokine secretion abnormalities act as AD trigger or are just consequence of disease activity remains to be elucidated. In order to address this issue, it is important to identify potential different subtypes of cytokine-producing B-cells, as well as to measure the effect of different therapies on cytokine production (3). 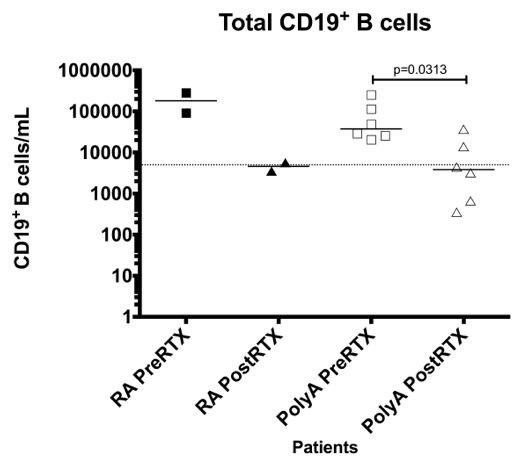 Therefore, as an exploratory study, we aimed to test the hypothesis that plasma cytokines in patients with RA and SLE-associated PolyA differ before and after treatment with RTX. We included plasma samples from 11 patients with autoimmune rheumatic diseases and 8 healthy controls, previously reported (45). Five patients had RA only and six had SLE, according to American College of Rheumatology (ACR) 1987 and ACR 1982 diagnostic criteria, respectively. SLE patients had more than one AD (Table 1). This phenomenon is known as PolyA, and 3 of these patients exhibited Multiple Autoimmune Syndrome (i.e., presence of three or more well-defined ADs) (2). *Defined as the first diagnosed autoimmune disease. Adapted from: Herrera D, Rojas OL, Duarte-Rey C, Mantilla RD, Angel J, Franco M a. 2014. Simultaneous assessment of rotavirus specific memory B cells and serological memory after B cell depletion therapy with rituximab. PLoS One 9:e97087. Hypothyroidism (HT) was not confirmed to have an autoimmune etiology; nonetheless, it was considered of autoimmune origin given the fact it is the leading cause of HT in places with adequate coverage of iodized salt (46), such as our scenario, Bogota, Colombia’s capital city. Furthermore, HT is the most common comorbidity in patients with ADs (2). Three patients from our prior study were excluded (45) (a) one with RA-non SLE associated PolyA, (b) one with SLE solely, and (c) one for which samples were not available. The first diagnosed AD was considered the principal diagnosis and was used as the criterion to determine to which group each patient belonged. Despite treatment with disease-modifying antirheumatic drugs, standard immunosuppressive therapy, or biologic therapy, all patients (except two with no data) had moderate or high disease activity measured by the Disease Activity Score of 28 joint count (DAS28) or SLE Disease Activity Index (SLEDAI). Given the failure to respond to standard treatment regimens, they were selected to receive RTX by their treating rheumatologist. Additional clinical manifestations considered for using RTX as the treatment of choice in patients included: Lupus nephritis (n=1), Autoimmune thrombocytopenia (n=1), polyautoimmunity of RA and SLE (n=4), and Antiphospholipid syndrome (n=2). The median age at RTX treatment was 46 years (range 29–69) and the median disease duration to the time prior to RTX treatment was 3 years (range 1–30); six patients had been diagnosed within three years or less. The treatment regimen included two infusions of intravenous RTX (1000 mg), 14 days apart, in combination with intravenous methylprednisolone (100–250 mg) (47,48). The most common concomitant AD was RA (4 patients), followed by HT (3 patients). Nine patients (82%) were on glucocorticoids. Table 1 describes accompanying autoimmune diagnoses, concomitant and relevant previous pharmacologic treatment, baseline disease activity, and clinical follow up. Eight healthy adult volunteers (median age 44.5, range 26-72 years) were used as controls. Written informed consent was obtained from each adult volunteer. Studies were approved by the Ethics Committee of the San Ignacio University Hospital and Pontificia Universidad Javeriana, and conducted in accordance with the guidelines of the Helsinki Declaration. Blood samples were collected prior and 6 months after RTX therapy. As these samples were used in a prior study, they had one freeze-thaw cycle before they were used for this study, after which they were re-stored at −80 ºC. For this study, samples were thawed at room temperature before cytokine measurements were performed. ELISA-based assays were used to measure IFN-α (Verikine Human IFN-α ELISA Kit; Pestka Biomedical Laboratories) and TGF-β1 (DuoSet ELISA Human TGF-β1; R&D Systems). TNF-α, IL-1β, IL-6, IL-8, IL-10, and IL-12p70 were measured using a Cytometric Bead Array (CBA)-based assay (Human Inflammatory Cytokines Kit; BD), following the manufacturer’s instructions (49). The detection limits (pg/mL) were as follows: IFN-α 125; TNF-α 3.7; IL-1β 7.2; IL-6 2.5; IL-8 3.6; IL-10 3.3; IL-12p70 1.9 and TGF-β1 31.5. If results were below these values, half of the detection limit was assigned for statistical analysis. Analysis was performed using Excel 2011 and Graphpad Prism version 6.0 for Mac. Differences between groups were evaluated with nonparametric Mann-Whitney’s (unpaired) or Wilcoxon’s (paired) tests, as required. Significance was established if p<0.05. Two-tailed analyses were performed. Analysis of plasma cytokines levels prior to BCDT and six months after RTX treatment of all rheumatic patients showed that IL-6 and IL-8 were significantly elevated in patients prior to RTX compared with controls (Figures 1A and 1B, Table S1). No statistical differences were observed for IFN-α and TGF-β1 (Figures 1C and 1D, Table S1). There was a significant reduction in IL-6 six months after RTX treatment, but neither IFN-α nor IL-8 showed any change. Of note, a trend towards elevation for TGF-β1 was observed. TNF-α, IL-1β, IL-10, and IL-12p70 concentrations were below the detection limit for both patients and controls (data not shown). Levels of cytokines in plasma samples of five RA and six SLE-associated PolyA patients, prior and 6 months after RTX treatment, were analyzed using either ELISA (i.e., IFNα, TGFβ1) or CBA (i.e., IL-6, IL-8), as described in Material and Methods. Control plasma samples were obtained from eight healthy controls. Concentrations of each cytokine are presented in pg/mL. PreRTX indicates levels prior to therapy, PostRTX indicates levels after therapy. HC indicates healthy control individuals. Statistical analysis with Mann-Whitney’s test was used when non-matched results were compared (i.e., HC vs. Pre/PostRTX) and Wilcoxon’s test when matched results were benchmarked (i.e., Pre vs. PostRTX). P values are represented as follows: NS, P>0.05; * P<0.05; ** P<0.001; *** P<0.0001. Effect of RTX on median (range) levels of plasma cytokines (pg/mL) of patients with rheumatic diseases. HC Healthy controls; PreRTX Levels prior to therapy; PostRTX Levels after therapy. a Using Mann-Whitney’s U Test. c P-value unavailable as the data are equal for every patient. To investigate whether there were differences between RA and SLE-associated PolyA, we analyzed the two groups separately (Figure 2, Table S2). Prior to BCDT, RA patients showed increased levels of IL-6 and IL-8 compared with controls, while PolyA patients showed elevated levels only for IL-8 (Figures 2A and 2B), although a non-significant difference in IL-6 was detected (p=0.055). A trend towards increased concentration of IFN-α was observed in RA patients, but not in SLE-associated PolyA patients (Figure 2C). Concentrations of each cytokine are presented in pg/mL. RA-pre/PolyA-pre indicates levels prior to therapy, RA-post/PolyA indicates levels after therapy. HC indicates healthy control individuals. Statistical analysis with Mann-Whitney’s test was used when non-matched results were compared (i.e., HC vs. Pre/PostRTX) and Wilcoxon’s test when matched results were compared (i.e., Pre vs. PostRTX). P values are represented as follows: NS, P>0.05; * P<0.05; ** P<0.001; *** P<0.0001. P-values disclosed for IL-6 in RA-pre vs RA-post patients, as well as IL-8 in PolyA-pre vs Poly-post patients, were calculated using one-tailed tests. Effect of RTX on median (range) levels of plasma cytokines (pg/mL) according to rheumatic disease subgroup (RA or SLE-associated PolyA). HC Healthy controls; PolyA Polyautoimmunity; PreRTX Levels prior to therapy; RA Rheumatoid arthritis; PostRTX Levels after therapy. After six months of RTX treatment, no significant reduction of neither IL-6 nor IL-8 were observed in neither group, using the two-tailed Wilcoxon’s test. However, bearing in mind that a substantial proportion of our sample (82%) had RA, and based on the mounting evidence that supports (a) the potential of ACPAs in inducing IL-8 secretion (50) and (b) the existence of IL-8 (8) and IL-6 (7) secretion by B-cells, we hypothesize that a significant reduction of these cytokines after BCDT should be observed. Thus, a one-tailed Wilcoxon’s test was performed. There was a significant reduction of IL-6 levels in RA patients and of IL-8 in SLE-associated PolyA patients after six months of RTX treatment, when a one-tailed test was performed. No differences were observed regarding IL-6 in SLE-associated PolyA patients and IL-8 in RA patients. Interestingly, IL-8 remained significantly elevated in both RA and SLE-associated PolyA patients compared with controls. Of note, after BCDT a trend towards elevation of TGF-β1 was observed in RA patients (Table S2). Our analysis of plasma cytokines before and after BCDT therapy supports the importance of B-cells cytokine secretion in RA and SLE-associated PolyA, and suggests a differential role in each pathology. As expected (22,51,52,53), patients with RA had higher levels of IL-6 compared with controls and presented a significant decrease after 6-months of BCDT (Figure 2A). These findings support the importance of B-cells as IL-6-secreting cells in this pathology. In agreement with this result, Lal et al. showed that high IL-6 levels are good predictors of response to RTX in patients with RA (22). Barr et al. showed the capability and importance of B-cells as IL-6 secreting cells in AD, and found that BCDT ameliorated clinical outcomes of mice with experimental autoimmune encephalomyelitis, a murine model of MS (7). As RA and MS share common pathogenic pathways (3), B-cell ablation may explain our results regarding IL-6 reduction after BCDT in RA patients. In contrast with our finding that IL-6 concentrations detected in SLE associated PolyA patients were similar to control individuals (Figure 2A), using ELISA Talaat et al. showed that in both, SLE and RA patients, IL-6 is increased respect to controls (53). Besides, Pollard et al. (39) found that SS patients had increased levels of IL-6 compared with controls. Thus, it is possible that PolyA, SLE, and SS subgroups of patients may or may not have increased levels of IL-6. This hypothesis is supported by our results of Figure 2B in which heterogeneous levels of IL-6 in plasma of PolyA patients were observed. We highlight that few studies have been performed to assess cytokines in PolyA prior and after RTX, as most reports address SLE exclusively or a single AD (e.g., RA, SS, etc.). As patients with PolyA had more than one AD, each with a differential cytokine pathway or expression pattern, multiple and probably unknown complex interactions between these processes may be present and should be explored. As autoimmunity arises from the promotion of autoreactive T and B cells, an interesting approach to these interactions should be the existence of special lymphocyte populations, such as the small subset of CD-20 expressing T-cells. Emerging evidence suggests they constitutively produce cytokines (e.g., IL-1b, IL-2, IL-8, IL-10, IL-4, IL-17, IFN-g, TGF-b, and TNF-α) (54,55). Although their functional role remains unclear, their importance and cytokine production capabilities are evident, however their production of IL-6 is low or inexistent (54), thus, we consider they are not a meaningful source of this cytokine. Finally, it has been suggested that their depletion—as a direct effect of RTX—may partly explain the efficacy of RTX in ADs, such as RA and MS (56). Compared with controls, all patients, either RA or SLE-associated PolyA, had increased plasma levels of IL-8 (Figures 1B and 2B). In agreement with these results, concentrations of circulating IL-8 have been shown to be elevated in RA patients (52,57) and in SLE patients (without association with arthritis) compared with control individuals in some (58) but not all studies (39,59,60). In contrast, after 6-months of BCDT a significant decrease was only observed in SLE-associated PolyA patients (Figure 2B), that, to our knowledge, has not been previously reported. In agreement with our findings, Keren et al. showed that in RA patients IL-8 increased by up to 100-fold 8 weeks after the administration of RTX (despite clinical improvement) and returned to baseline 24 weeks after the treatment. In addition, they showed that antibody-IL-8 immune complex deposits in synovial tissue of RA patients, which may trigger and perpetuate an inflammatory response (61). Moreover, their results revealed that RTX may improve the clinical status by reducing both available anti-IL-8 antibody and IL-8 itself (61). In contrast with our results (Figure 2B), decreased IL-8 concentrations in RA patients after RTX therapy was observed by Fabre et al. (62) measuring cytokine levels with protein biochip array. Interestingly, this was only observed in patients without clinical improvement (i.e., non-responders). Further, B-cells appear to be an important source of IL-8 either by Ab-dependent (50) or Ab-independent (8) (i.e., IL-8-secreting cells) mechanisms. Given the potential role of IL-8 in autoimmunity, which has been highlighted by our study, more studies of this cytokine as a biomarker or a therapeutic target are warranted. A trend towards increased plasma levels of IFN-α in RA patients (Figure 2C) was, as expected (63), detected. However, patients with SLE-associated PolyA showed comparable levels to control individuals (Figure 2C). A positive IFN signature has been associated with progression to RA in patients with positive ACPA, which may be related to the antibody-induction capability of IFN (64). Regarding PolyA, our results seem contrary to literature reports since the IFN signature has been found up-regulated in SLE and SS patients (65). These findings support the existence of clinical subgroups of patients that may need differential treatment (66). We found a trend towards increased plasma concentrations of TGF-β1 after RTX therapy in RA patients (Figure 2D), which suggests a cytokine shift towards anti-inflammation. Contrary, high levels of TGF-β1 have been associated with articular damage in other studies (67,68), and lower levels were detected in patients with SLE and Hashimoto’s thyroiditis compared with controls (69). Another study, in which TGF-β1 serum levels were measured in patients with RA compared with RA and SS (i.e., Polyautoimmunity), identified significantly higher levels of TGF-β1 in RA patients that related to joint damage, calculated with Steinbrocker index (70). Thus, the potential of TGF-β1 and anti-inflammatory cytokines as biomarkers needs to be in the research agenda. Although we assessed other cytokines by CBA (i.e., IL-1β, IL-10, IL-12p70, and TNF-α) results were below the assay’s sensitivity threshold (data not shown). Our study presents some limitations. First, serum cytokine assessment is controversial due to its variability and susceptibility to a wide number of both internal and external influences, and the instability of the cytokines in the samples (71,72). This phenomenon was observed by De Jager et al., and prompted them to propose some prerequisites for cytokine measurements using multiplex immunoassays, since IL-1β and IL-10 were almost totally degraded after 4 years of storage (71). 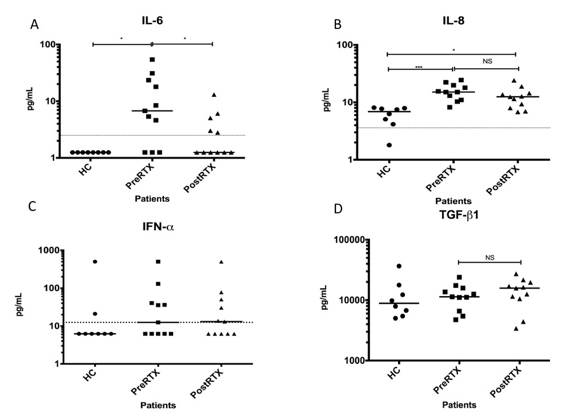 Moreover, IL-6, IL-12, and TNF-α were degraded close to a 50% by the same time (71). However, our exploratory results with samples frozen for over 4 years showed positive and statistically significant findings for two cytokines, and support the importance of performing a larger study with fresh samples. Second, our results are limited to differential cytokine protein expression in patients with PolyA, and further studies using transcriptional expression measurement are warranted, because several cell populations may produce measured plasma cytokines. Third, it is considered that after 6 months of BCDT some patients present B-cells repopulation as an effect of the increase in BAFF levels (6), which may bias cytokine concentration. Nonetheless, B-cell numbers in most of our samples (8 out of 11) were assessed by flow cytometry in a previous study (45), and we observed that 5 out of 8 available patients did not have B-cell repopulation (>5000 cells/mL) (Figures S1 and S2), suggesting that this was not an important variable in our study. Finally, although our results either support (e.g., IL-6 and RA) or suggest (e.g., IL-8 and SLE-associated PolyA) the association of the measured cytokines with the assessed ADs, we acknowledge that the limited statistical power of our study due to our small sample, the hurdle of lost data and the potential drawback of one-tailed tests, may ultimately lead to a limited external validity. Further, although a differential cytokine secretion appears to be present in our uneven sample of PolyA patients, we have recognized the heterogeneity of the PolyA patient population, which highlights the importance of the selection of specific PolyA subsets in future research. Our results require confirmation on a larger sample. Solid lines denote the median value. The dashed line represents the clinical depletion limit after RTX treatment (<5000 CD19+ cells/mL). Differences between patients PreRTX and patients PostRTX were evaluated with Wilcoxon’s test. All p values reported are 2-tailed. These data are from our previous publication: “Simultaneous assessment of rotavirus-specific memory B cells and serological memory after B cell depletion therapy with rituximab. PLoS One 2014;9:e97087” and presented here to facilitate reading of the present paper. Solid lines denote the median value. The dashed line represents the clinical depletion limit after RTX treatment (<5000 CD19+ cells/mL). Differences between PolyA patients PreRTX and PolyA patients PostRTX were evaluated with Wilcoxon’s test. Due to the low number of available patients in the RA subgroup, no difference could be observed. All p values reported are 2-tailed. These data are from our previous publication: “Simultaneous assessment of rotavirus-specific memory B cells and serological memory after B cell depletion therapy with rituximab. PLoS One 2014;9:e97087” and presented here to facilitate reading of the present paper. The identification of specific cellular populations involved in the pathogenesis of ADs represents a provocative treatment target. To our knowledge, we offer the first report on cytokine assessment prior and after BCDT in patients with SLE-associated PolyA. Clinical trials’ results suggest that different subgroups with different responses to treatment may exist. On the other hand, available data for patients with two or more ADs (i.e., Polyautoimmunity) are scarce, although these patients may represent more than 30% of clinical population in rheumatology clinics, and this phenomenon may have a genetic basis when presenting as an extreme phenotype (73,74). This scenario supports the need for more studies in diverse populations (particularly PolyA), which represents a large proportion of the clinical real-world scenario. Such data should allow the implementation of personalized medicine, in which the accurate selection of individuals for each therapy will lead to a personalized treatment, and probably the prediction and prevention of clinical outcomes. Mounting evidence supports the utility of these tools in the near future (75,76). ADs are complex and heterogeneous entities related to a common factor: a breakdown in self-tolerance. The serum cytokine profile has been largely assessed in several ADs, but is scarce in PolyA. Our results suggest the interaction of different pathogenic phenomena in PolyA vs. RA patients. Since measured plasma cytokines may be produced by several cell populations, larger studies assessing their specific production by B-cells are warranted. This subject needs to be better investigated in the heterogeneous PolyA patients. 1. Hayter SM, Cook MC. Updated assessment of the prevalence, spectrum and case definition of autoimmune disease. Autoimmun Rev. 2012;11(10):754–65. 2. Rojas-Villarraga A, Amaya-Amaya J, Rodriguez-Rodriguez A, Mantilla RD, Anaya J-M. Introducing polyautoimmunity: Secondary autoimmune diseases no longer exist. Autoimmune Dis. 2012;(1):254319. 3. Lino AC, Dörner T, Bar-Or A, Fillatreau S. Cytokine-producing B cells: a translational view on their roles in human and mouse autoimmune diseases. Immunol Rev. 2016;269(1):130–44. 4. Shen P, Fillatreau S. Antibody-independent functions of B cells: A focus on cytokines. Nat Rev Immunol. 2015;15(7):441–51. 5. Bao Y, Cao X. The immune potential and immunopathology of cytokine-producing B cell subsets: A comprehensive review. J Autoimmun. 2014;55(1):10–23. 6. Ospina FE, Betancur JF, Suso JP, Muñoz-Buitron E, Cañas CA, Tobón GJ. Papel de la citocina BAFF en las enfermedades autoinmunes: Rol fisiopatológico y estrategias terapeúticas. Rev Colomb Reumatol. 2016;23(3):177–94. 7. Barr TA, Shen P, Brown S, Lampropoulou V, Roch T, Lawrie S, et al. B cell depletion therapy ameliorates autoimmune disease through ablation of IL-6–producing B cells. J Exp Med. 2012;209(5):1001–10. 8. Ali MF, Driscoll CB, Walters PR, Limper AH, Carmona EM. Glucan-Activated Human B Lymphocytes Participate in Innate Immune Responses by Releasing Proinflammatory Cytokines and Stimulating Neutrophil Chemotaxis. J Immunol. 2015;195(11):5318–26. 9. Tay C, Liu Y-H, Hosseini H, Kanellakis P, Cao A, Peter K, et al. B-cell-specific depletion of tumour necrosis factor alpha inhibits atherosclerosis development and plaque vulnerability to rupture by reducing cell death and inflammation. Cardiovasc Res. 2016;111(4):385–97. 10. Opata MM, Ye Z, Hollifield M, Garvy BA. B cell production of tumor necrosis factor in response to Pneumocystis murina infection in mice. Infect Immun. 2013;81(11):4252–60. 11. Airoldi I, Guglielmino R, Carra G, Corcione A, Gerosa F, Taborelli G, et al. The interleukin-12 and interleukin-12 receptor system in normal and transformed human B lymphocytes. Haematologica. 2002;87(4):434–42. 12. Rincón-Arévalo H, Sánchez-Parra CC, Castaño D, Yassin L, Vásquez G. Regulatory B cells and mechanisms. Int Rev Immunol. 2016;35(2):156–76. 13. Benjamin D, Dower SK. Human B cells express two types of interleukin-1 receptors. Blood. 1990;75(10):2017–23. 14. Pike BL, Nossal GJ. Interleukin 1 can act as a B-cell growth and differentiation factor. Proc Natl Acad Sci U S A. 1985;82(23):8153–7. 15. Rieckmann P, Tuscano JM, Kehrl JH. Tumor necrosis factor-alpha (TNF-alpha) and interleukin-6 (IL-6) in B-lymphocyte function. Methods. 1997;11(1):128–32. 16. Rosser EC, Oleinika K, Tonon S, Doyle R, Bosma A, Carter NA, et al. Regulatory B cells are induced by gut microbiota-driven interleukin-1β and interleukin-6 production. Nat Med. 2014;20(11):1334–9. 17. Kiefer K, Oropallo MA, Cancro MP, Marshak-Rothstein A. Role of type I interferons in the activation of autoreactive B cells. Immunol Cell Biol. 2012;90(5):498–504. 18. Singh N, Kumar B, Aluri V, Lenert P. Interfering with baffled B cells at the lupus tollway: Promises, successes, and failed expectations. J Allergy Clin Immunol. 2016;137(5):1325–33. 19. Berggren O, Hagberg N, Weber G, Alm GV, Rönnblom L, Eloranta M-L. B lymphocytes enhance interferon-α production by plasmacytoid dendritic cells. Arthritis Rheum. 2012;64(10):3409–19. 20. Tak PP, Thurlings RM, Rossier C, Nestorov I, Dimic A, Mircetic V, et al. Atacicept in patients with rheumatoid arthritis: Results of a multicenter, phase Ib, double-blind, placebo-controlled, dose-escalating, single- and repeated-dose study. Arthritis Rheum. 2008;58(1):61–72. 21. Van Vollenhoven RF, Kinnman N, Vincent E, Wax S, Bathon J. Atacicept in patients with rheumatoid arthritis and an inadequate response to methotrexate: Results of a phase II, randomized, placebo-controlled trial. Arthritis Rheum. 2011;63(7):1782–92. 22. Lal P, Su Z, Holweg CTJ, Silverman GJ, Schwartzman S, Kelman A, et al. Inflammation and autoantibody markers identify rheumatoid arthritis patients with enhanced clinical benefit following rituximab treatment. Arthritis Rheum. 2011;63(12):3681–91. 23. Emery P, Fleischmann R, Filipowicz-Sosnowska A, Schechtman J, Szczepanski L, Kavanaugh A, et al. The efficacy and safety of rituximab in patients with active rheumatoid arthritis despite methotrexate treatment: Results of a phase IIB randomized, double-blind, placebo-controlled, dose-ranging trial. Arthritis Rheum. 2006;54(5):1390–400. 24. Cohen SB, Emery P, Greenwald MW, Dougados M, Furie RA, Genovese MC, et al. Rituximab for rheumatoid arthritis refractory to anti–tumor necrosis factor therapy: Results of a multicenter, randomized, double-blind, placebo-controlled, phase III trial evaluating primary efficacy and safety at twenty-four weeks. Arthritis Rheum. 2006;54(9):2793–806. 25. Emery P, Deodhar A, Rigby WF, Isaacs JD, Combe B, Racewicz AJ, et al. Efficacy and safety of different doses and retreatment of rituximab: a randomised, placebo-controlled trial in patients who are biological naive with active rheumatoid arthritis and an inadequate response to methotrexate. Ann Rheum Dis. 2010;69(9):1629–35. 26. Roll P, Dörner T, Tony H-P. Anti-CD20 therapy in patients with rheumatoid arthritis: Predictors of response and B cell subset regeneration after repeated treatment. Arthritis Rheum. 2008;58(6):1566–75. 27. Cambridge G, Perry HC, Nogueira L, Serre G, Parsons HM, De La Torre I, et al. The effect of B-cell depletion therapy on serological evidence of B-cell and plasmablast activation in patients with rheumatoid arthritis over multiple cycles of rituximab treatment. J Autoimmun. mayo de 2014;50:67–76. 28. Burmester GR, Feist E, Dörner T. Emerging cell and cytokine targets in rheumatoid arthritis. Nat Rev Rheumatol. 2014;10(2):77–88. 29. Rojas-Villarraga A, Toro C-E, Espinosa G, Rodríguez-Velosa Y, Duarte-Rey C, Mantilla RD, et al. Factors influencing polyautoimmunity in systemic lupus erythematosus. Autoimmun Rev. 2010;9(4):229–32. 30. Amador-Patarroyo MJ, Arbeláez JG, Mantilla RD, Rodríguez-Rodríguez A, Cárdenas-Roldán J, Pineda-Tamayo R, et al. Sjögren’s syndrome at the crossroad of polyautoimmunity. J Autoimmun. 2012;39(3):199–205. 31. Pacheco Y, Barahona-Correa J, Monsalve DM, Acosta-Ampudia Y, Rojas M, Rodríguez Y, et al. Cytokine and autoantibody clusters interaction in systemic lupus erythematosus. J Transl Med. 2017;15(1):239. 32. Chan OTM, Hannum LG, Haberman AM, Madaio MP, Shlomchik MJ. A Novel Mouse with B Cells but Lacking Serum Antibody Reveals an Antibody-independent Role for B Cells in Murine Lupus. J Exp Med. 1999;189(10):1639–48. 33. Navarra S V, Guzmán RM, Gallacher AE, Hall S, Levy RA, Jiménez RE, et al. Efficacy and safety of belimumab in patients with active systemic lupus erythematosus: a randomised, placebo-controlled, phase 3 trial. Lancet. 2011;377(9767):721–31. 34. Furie R, Petri M, Zamani O, Cervera R, Wallace DJ, Tegzová D, et al. A phase III, randomized, placebo-controlled study of belimumab, a monoclonal antibody that inhibits B lymphocyte stimulator, in patients with systemic lupus erythematosus. Arthritis Rheum. 2011;63(12):3918–30. 35. Merrill JT, Neuwelt CM, Wallace DJ, Shanahan JC, Latinis KM, Oates JC, et al. Efficacy and safety of rituximab in moderately-to-severely active systemic lupus erythematosus: the randomized, double-blind, phase II/III systemic lupus erythematosus evaluation of rituximab trial. Arthritis Rheum. 2010;62(1):222–33. 36. Rovin BH, Furie R, Latinis K, Looney RJ, Fervenza FC, Sánchez-Guerrero J, et al. Efficacy and safety of rituximab in patients with active proliferative lupus nephritis: the Lupus Nephritis Assessment with Rituximab study. Arthritis Rheum. 2012;64(4):1215–26. 37. Kroese FG, Abdulahad WH, Haacke E, Bos NA, Vissink A, Bootsma H. B-cell hyperactivity in primary Sjogren’s syndrome. Expert Rev Clin Immunol. 2014;10(4):483–99. 38. Meijer JM, Meiners PM, Vissink A, Spijkervet FKL, Abdulahad W, Kamminga N, et al. Effectiveness of rituximab treatment in primary sjögren’s syndrome: A randomized, double-blind, placebo-controlled trial. Arthritis Rheum. 2010;62(4):960–8. 39. Pollard RPE, Abdulahad WH, Bootsma H, Meiners PM, Spijkervet FKL, Huitema MG, et al. Predominantly proinflammatory cytokines decrease after B cell depletion therapy in patients with primary Sjogren’s syndrome. Ann Rheum Dis. 2013;72(12):2048–50. 40. Tani C, D’Aniello D, Delle Sedie A, Carli L, Cagnoni M, Possemato N, et al. Rhupus syndrome: assessment of its prevalence and its clinical and instrumental characteristics in a prospective cohort of 103 SLE patients. Autoimmun Rev. 2013;12(4):537–41. 41. Amaya-Amaya J, Molano-González N, Franco J-S, Rodríguez-Jiménez M, Rojas-Villarraga A, Anaya J-M. Anti-CCP antibodies as a marker of rhupus. Lupus. 2015;24(8):892–4. 42. Andrade-Ortega L, Irazoque-Palazuelos F, Muñoz-López S, Rosales-Don Pablo VM. Efficacy and tolerability of rituximab in patients with rhupus. Reumatol Clin. 2013;9(4):201–5. 43. Fabris M, Quartuccio L, Lombardi S, Saracco M, Atzeni F, Carletto A, et al. The CC homozygosis of the -174G>C IL-6 polymorphism predicts a lower efficacy of rituximab therapy in rheumatoid arthritis. Autoimmun Rev. marzo de 2012;11(5):315–20. 44. Das S, Vital EM, Horton S, Bryer D, El-Sherbiny Y, Rawstron AC, et al. Abatacept or tocilizumab after rituximab in rheumatoid arthritis? : An exploratory study suggests non-response to rituximab is associated with persistently high IL-6 and better clinical response to IL-6 blocking therapy. Ann Rheum Dis. mayo de 2014;73(5):909–12. 45. Herrera D, Rojas OL, Duarte-Rey C, Mantilla RD, Angel J, Franco MA. Simultaneous assessment of rotavirus-specific memory B cells and serological memory after B cell depletion therapy with rituximab. PLoS One. 2014;9(5):e97087. 46. Almandoz JP, Gharib H. Hypothyroidism: Etiology, Diagnosis, and Management. Med Clin North Am. 2012;96(2):203–21. 47. Singh JA, Furst DE, Bharat A, Curtis JR, Kavanaugh AF, Kremer JM, et al. 2012 update of the 2008 American College of Rheumatology recommendations for the use of disease-modifying antirheumatic drugs and biologic agents in the treatment of rheumatoid arthritis. Arthritis Care Res (Hoboken). 2012;64(5):625–39. 48. Bertsias G, Ioannidis JP a, Boletis J, Bombardieri S, Cervera R, Dostal C, et al. EULAR recommendations for the management of systemic lupus erythematosus. Report of a Task Force of the EULAR Standing Committee for International Clinical Studies Including Therapeutics. Ann Rheum Dis. 2008;67(2):195–205. 49. Parra M, Herrera D, Jácome MF, Mesa MC, Rodríguez L-S, Guzmán C, et al. Circulating rotavirus-specific T cells have a poor functional profile. Virology. 2014;468–470:340–50. 50. Krishnamurthy A, Joshua V, Haj Hensvold A, Jin T, Sun M, Vivar N, et al. Identification of a novel chemokine-dependent molecular mechanism underlying rheumatoid arthritis-associated autoantibody-mediated bone loss. Ann Rheum Dis. 2016;75(4):721–9. 51. Kosek E, Altawil R, Kadetoff D, Finn A, Westman M, Le Maître E, et al. Evidence of different mediators of central inflammation in dysfunctional and inflammatory pain - Interleukin-8 in fibromyalgia and interleukin-1 β in rheumatoid arthritis. J Neuroimmunol. 2015;280:49–55. 52. Klimiuk PA, Sierakowski S, Domyslawska I, Chwiecko J. Serum chemokines in patients with rheumatoid arthritis treated with etanercept. Rheumatol Int. 2011;31(4):457–61. 53. Talaat RM, Mohamed SF, Bassyouni IH, Raouf A a. Th1/Th2/Th17/Treg cytokine imbalance in systemic lupus erythematosus (SLE) patients: Correlation with disease activity. Cytokine. 2015;72(2):146–53. 54. Schuh E, Berer K, Mulazzani M, Feil K, Meinl I, Lahm H, et al. Features of Human CD3+CD20+ T Cells. J Immunol. 2016;197(4):1111–7. 55. Wilk E, Witte T, Marquardt N, Horvath T, Kalippke K, Scholz K, et al. 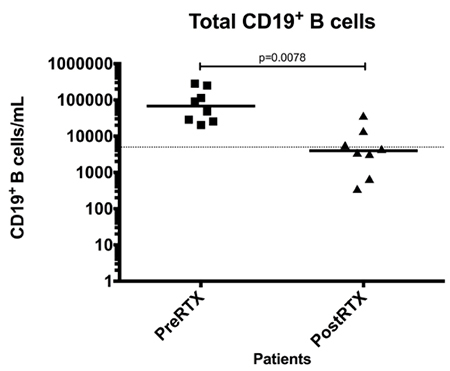 Depletion of functionally active CD20+ T cells by rituximab treatment. Arthritis Rheum. diciembre de 2009;60(12):3563–71. 56. Marino M, Bartoccioni E, Alboini PE, Evoli A. Rituximab in myasthenia gravis: A “to be or not to be” inhibitor of T cell function. Ann N Y Acad Sci. 2018;1413(1):41–8. 57. Kaneko S, Satoh T, Chiba J, Ju C, Inoue K, Kagawa J. Interleukin-6 and interleukin-8 levels in serum and synovial fluid of patients with osteoarthritis. Cytokines Cell Mol Ther. 2000;6(2):71–9. 58. Eilertsen G, Nikolaisen C, Becker-Merok A, Nossent J. Interleukin-6 promotes arthritis and joint deformation in patients with systemic lupus erythematosus. Lupus. 2011;20(6):607–13. 59. Willis R, Seif AM, McGwin G, Martinez-Martinez LA, González EB, Dang N, et al. Effect of hydroxychloroquine treatment on pro-inflammatory cytokines and disease activity in SLE patients: data from LUMINA (LXXV), a multiethnic US cohort. Lupus. 2012;21(8):830–5. 60. Hrycek E, Franek A, Błaszczak E, Dworak J, Hrycek A. Serum levels of selected chemokines in systemic lupus erythematosus patients. Rheumatol Int. 2013;33(9):2423–7. 61. Keren Z, Braun-Moscovici Y, Markovits D, Rozin A, Nahir M, Balbir-Gurman A, et al. Depletion of B lymphocytes in rheumatoid arthritis patients modifies IL-8-anti-IL-8 autoantibody network. Clin Immunol. octubre de 2009;133(1):108–16. 62. Fabre S, Guisset C, Tatem L, Dossat N, Dupuy AM, Cohen JD, et al. Protein biochip array technology to monitor rituximab in rheumatoid arthritis. Clin Exp Immunol. 2009;155(3):395–402. 63. Crow MK. Type I interferon in organ-targeted autoimmune and inflammatory diseases. Arthritis Res Ther. 2010;12 Suppl 1(Suppl 1):S5. 64. van Baarsen LGM, Bos WH, Rustenburg F, van der Pouw Kraan TCTM, Wolbink GJJ, Dijkmans BAC, et al. Gene expression profiling in autoantibody-positive patients with arthralgia predicts development of arthritis. Arthritis Rheum. 2010;62(3):694–704. 65. Emamian ES, Leon JM, Lessard CJ, Grandits M, Baechler EC, Gaffney PM, et al. Peripheral blood gene expression profiling in Sjögren’s syndrome. Genes Immun. 2009;10(4):285–96. 66. Niewold TB. Connective tissue diseases: Targeting type I interferon in systemic lupus erythematosus. Nat Rev Rheumatol. 2016;12(7):377–8. 67. Yamanishi Y, Boyle DL, Clark M, Maki RA, Tortorella MD, Arner EC, et al. Expression and Regulation of Aggrecanase in Arthritis: The Role of TGF-. J Immunol. 2002;168(3):1405–12. 68. Sheng J, Chen W, Zhu H-J. The immune suppressive function of transforming growth factor- β (TGF- β ) in human diseases. Growth Factors. 2015;33(2):92–101. 69. Manolova I, Gerenova J, Ivanova M. Serum levels of transforming growth factor-β1 (TGF-β1) in patients with systemic lupus erythematosus and Hashimoto’s thyroiditis. Eur Cytokine Netw. 2013;24(1):69–74. 70. Mieliauskaite D, Venalis P, Dumalakiene I, Venalis A, Distler J. Relationship between serum levels of TGF-beta1 and clinical parameters in patients with rheumatoid arthritis and Sjögren’s syndrome secondary to rheumatoid arthritis. Autoimmunity. 2009;42(4):356–8. 71. de Jager W, Bourcier K, Rijkers GT, Prakken BJ, Seyfert-Margolis V. Prerequisites for cytokine measurements in clinical trials with multiplex immunoassays. BMC Immunol. 2009;10:52. 72. Zhou X, Fragala MS, McElhaney JE, Kuchel GA. Conceptual and methodological issues relevant to cytokine and inflammatory marker measurements in clinical research. Curr Opin Clin Nutr Metab Care. septiembre de 2010;13(5):541–7. 73. Anaya J-M. The diagnosis and clinical significance of polyautoimmunity. Autoimmun Rev. 2014;13(4–5):423–6. 74. Johar A, Sarmiento-Monroy JC, Rojas-Villarraga A, Silva-Lara MF, Patel HR, Mantilla RD, et al. Definition of mutations in polyautoimmunity. J Autoimmun. 2016;72:65–72. 75. Anaya J-M, Duarte-Rey C, Sarmiento-Monroy JC, Bardey D, Castiblanco J, Rojas-Villarraga A. Personalized medicine. Closing the gap between knowledge and clinical practice. Autoimmun Rev. 2016;8:833–42. 76. Ortega-Hernández OD, López-Guzmán S, Rojas-Villarraga A, Anaya J-M. Predicción de las enfermedades autoinmunes: Mito, realidad y riesgo. Rev Med. 2008;16(1):56–73. a MD. Pontificia Universidad Javeriana, Bogotá, Colombia. b MD, PhD. Institute of Human Genetics, Faculty of Medicine, Pontificia Universidad Javeriana, Bogotá, Colombia. c MD, PhD. Institute of Human Genetics, Faculty of Medicine, Pontificia Universidad Javeriana, Bogotá, Colombia. d MSc, PhD. Institute of Human Genetics, Faculty of Medicine, Pontificia Universidad Javeriana, Bogotá, Colombia. Funding: This research was supported by the Pontificia Universidad Javeriana.